Vitamins are the building blocks for our bodies. They help to ensure proper growth and maintenence of the mind and the body. They also help to prevent many diseases and illnesses. Vitamins are either fat-soluble or water-soluble. Fat-soluble vitamins are stored in your body fat and used when your body needs them. Water soluble vitamins are not stored in your body, but rather dispersed in your bloodstream and used up rapidly by your body. Water-soluble vitamins need to be replenished regularly. Natural foods are a great source of vitamins and minerals. 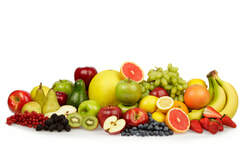 Fruits, vegetables, seafood, and poultry are all high in the essential nutrients.